The discovery of a new species of bird-like dinosaur is giving scientists new insight into the evolution of birds. The new species is 10 million years older than Archaeopteryx, the creature previously considered the oldest bird known to science, the discovery reclassified a family of bird-like creatures as avian, and, perhaps most importantly, it ended all debate around whether Archaeopteryx should truly be considered avian. About the size of a pheasant, the new species, named Aurornis xui, measured 50cm from its beak to the tip of its tail. It had a long tail and claws with legs similar to Archaeopteryx but some of its features were much more primitive. Encased in sedimentary rock, the fossil preserved traces of downy feathers along the animal's tail, neck and chest, but the absence of larger feathers suggests it was not able to fly. The dinosaur, which lived around 160 million years ago in the Middle-Late Jurassic period, was found in China's Liaoning province, an area where scientists believe early birds and feathered dinosaurs roamed together. The new species' name comes from Latin and Greek words: “Aurora” is Latin for “daybreak” or “dawn” and Ornis is Greek for “bird”. The last part of the name, “xui”, honours the paleontologist Xu Xing. 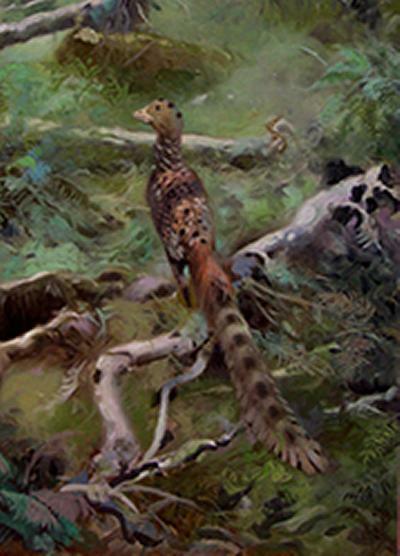 That the new species trumps Archaeopteryx as the oldest known bird is significant because when it was discovered in Germany in 1861, Archaeopteryx came to be seen as the first proof that birds evolved from dinosaurs and was the first fossil to support Darwin's theory of evolution, which was published around the same time. In addition to Aurornis xui, a number of similar creatures discovered in the famous fossil beds of Liaoning Province initially resulted in the demotion of Archaeopteryx from avian status to that of a bird-like dinosaur, a move that was contested because there was scientific consensus that Archaeopteryx could fly. “With the find of Aurornis xui, Archaeopteryx is again considered an ancestor of birds and the new creature we describe is also a basal bird; and in fact it is even more primitive than Archaeopteryx,” says Pascal Godefroit from the Royal Belgian Institute of Natural Sciences and lead author on the paper. The discovery of Aurornis xui also reclassified the status of Troodontidae, a family of bird-like dinosaurs. Godefroit and colleagues now consider the Troodontidae to be a sister group of the avians. “The new species is certainly an older member of the bird lineage than Archaeopteryx, and it's fair to call it a very primitive bird. But what you call a bird comes down to what you call a bird, and a lot of definitions depend on Archaeopteryx,” adds Paul Barrett of the Natural History Museum in London and co-author of the paper.